12 inch diameter, 9 in.height, 1000+ units, colors: turquoise and grey. I believe this origami bowl will lead to much larger creations simply because I have realized that this new paper medium actually has remarkable strength.Height is not a problem and it is not very difficult to flare out a side, change directions, or alter profiles. This is going to be a mathematical engineering investigation into sheer fun. 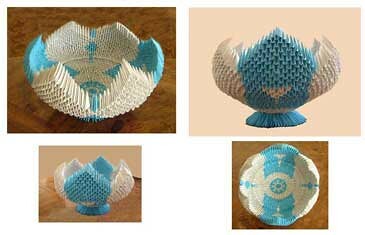 I think I may be able to offer some links to enable everyone to read more about this awsome style of Chinese paper folding. Genesis-Bowl_multiview_sm_0, originally uploaded by Fran Levinson. This entry was posted in art, Chinese art, cultures, origami, paper folding and tagged art, Chinese art, cultural art, origami art, sculpture. Bookmark the permalink.